Get from the airport to downtown Seoul in 43 minutes! Fast and easy experience! Highly recommended. I fell asleep during the ride from Seoul Stn to T1 then to T2. Comfy ride. Thanks Klook! 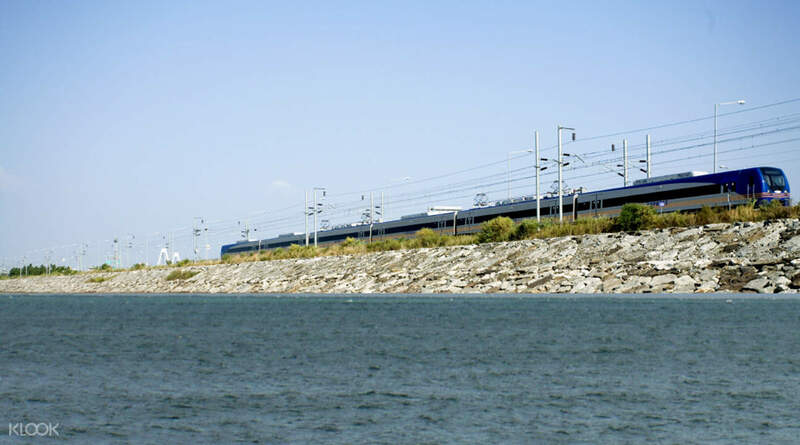 The Airport Railroad Express on the AREX line is the fastest and most efficient way to travel between Incheon International Airport and downtown Seoul. 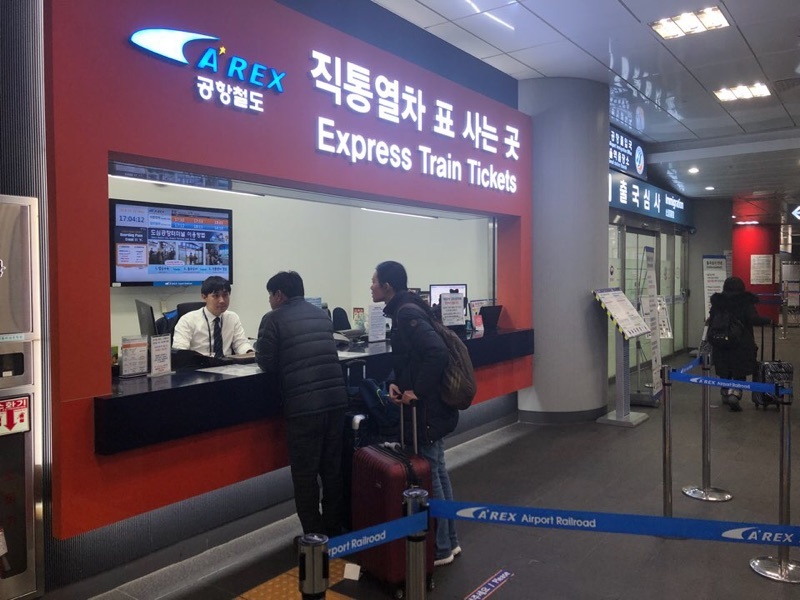 This Incheon Airport Railroad Express (AREX) train ticket will get you aboard the train and to the airport in as little as 43 minutes! For travels from the airport to Seoul, simply redeem your voucher for your ticket at the Transportation Center or 45th Information Booth upon arrival at the airport. With your ticket in hand, make your way to the B1 of Incheon International Transportation Center where you will board your train, equipped with comfortable seating and lots of room for your luggage. Make a second booking when returning from Seoul to the airport and redeem your voucher at Seoul Station, one of the most convenient stops in the city. Without leaving the station, you're able to board your train that will depart for Incheon International Airport. All trains run every 25-40 minutes and this allows you to easily keep up with your schedule and confidently make plans ahead. Take the Incheon airport train to get to downtown Seoul in just 43 minutes! Using AREX Incheon Airport Express Train to downtown Seoul was really fun and exciting! Less hassle everything was perfect we just followed all the instructions and in a snap here we are already boarded and reached downtown less than an hour! Thank you so much klook our forever travel partner since last year!!! Kudos! My son enjoyed his first train ride to Seoul! Really amazing! Using AREX Incheon Airport Express Train to downtown Seoul was really fun and exciting! Less hassle everything was perfect we just followed all the instructions and in a snap here we are already boarded and reached downtown less than an hour! Thank you so much klook our forever travel partner since last year!!! Kudos! My son enjoyed his first train ride to Seoul! Really amazing! The AREX experience was great. It was really a hassle free transfer from Incheon airport to Seoul station even with heavy luggage. 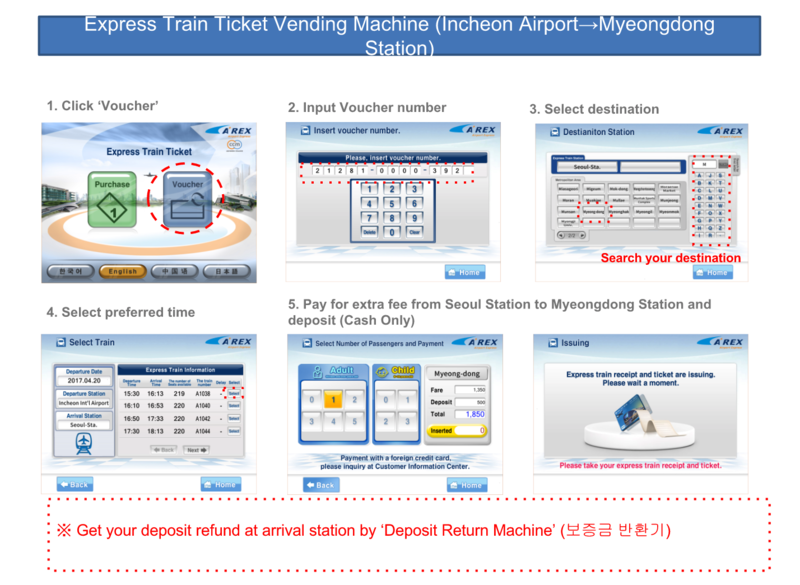 You can get the ticket in the vending machine before the AREX entrance and pay the deposit which can be refunded at the Seoul station deposit refund machine. The express train arrived on time. I was travelling with my parents and they enjoyed the ride to the Seoul station. There is free wifi onboard. The AREX experience was great. It was really a hassle free transfer from Incheon airport to Seoul station even with heavy luggage. 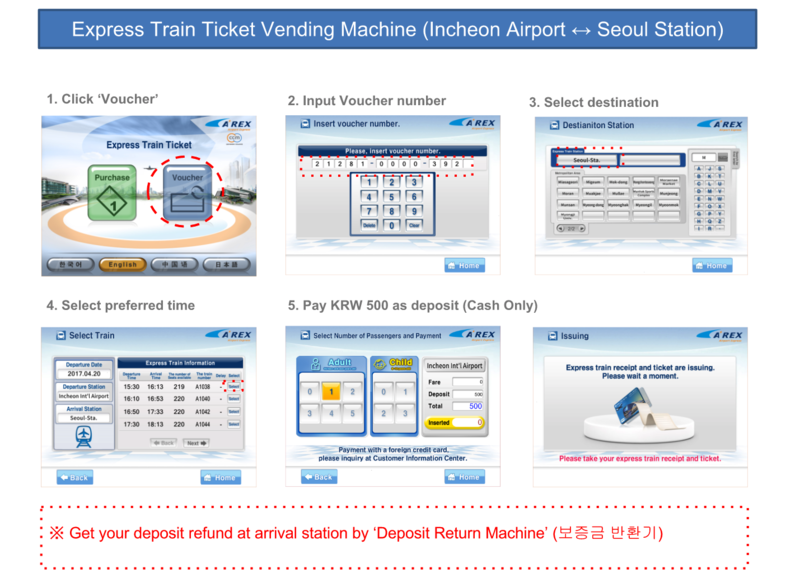 You can get the ticket in the vending machine before the AREX entrance and pay the deposit which can be refunded at the Seoul station deposit refund machine. The express train arrived on time. I was travelling with my parents and they enjoyed the ride to the Seoul station. There is free wifi onboard. The ride itself very easy, very comfortable. 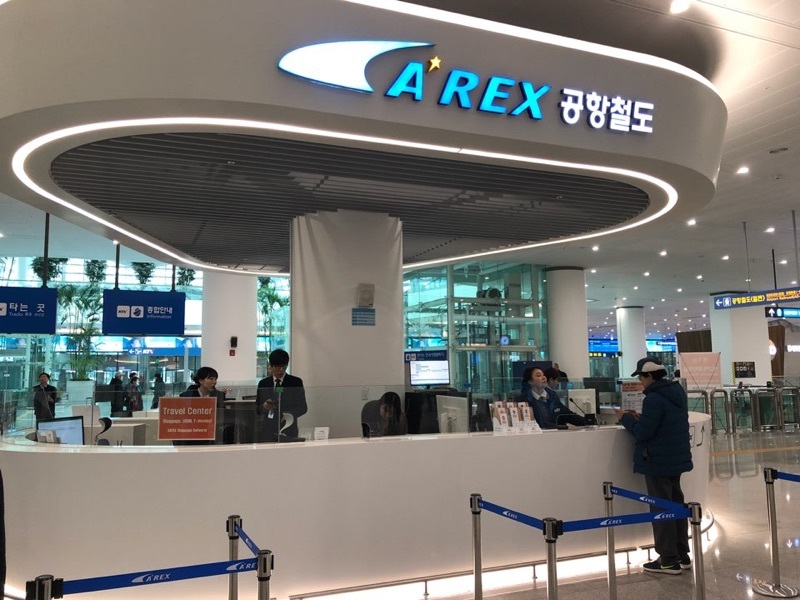 Found out that if you fly via Korean Air (there are others but cant remember which airline) you can check in your luggage, just near the AREX station, but must 3hours before your departure time. I have stayed at Namdaemun area, Hyohyeon station have both escalator and lift, same goes to Myeong-dong station. My challenge was, as a first timer, m running around to find a way to redeem the ticket because the counter in front of AREX station was closed. There was no staff to assist. They left message on how to redeem it but not clear to me. To found out that we just need to use our subway ticket to go through/tap your card to the exit (or they called it 'way out') it will lead you to the AREX station ;) The rest of the process easy peasy. The ride itself very easy, very comfortable. Found out that if you fly via Korean Air (there are others but cant remember which airline) you can check in your luggage, just near the AREX station, but must 3hours before your departure time. I have stayed at Namdaemun area, Hyohyeon station have both escalator and lift, same goes to Myeong-dong station. My challenge was, as a first timer, m running around to find a way to redeem the ticket because the counter in front of AREX station was closed. There was no staff to assist. They left message on how to redeem it but not clear to me. To found out that we just need to use our subway ticket to go through/tap your card to the exit (or they called it 'way out') it will lead you to the AREX station ;) The rest of the process easy peasy. love this arex ticket train since it was super easy to redeem so I don't need to buy and have queuing to get the ticket. u need to give deposit 500 won /car and u can redeem on arrival stop. I found it super helpful and fast to get into the city. highly recommended. love this arex ticket train since it was super easy to redeem so I don't need to buy and have queuing to get the ticket. u need to give deposit 500 won /car and u can redeem on arrival stop. I found it super helpful and fast to get into the city. highly recommended. 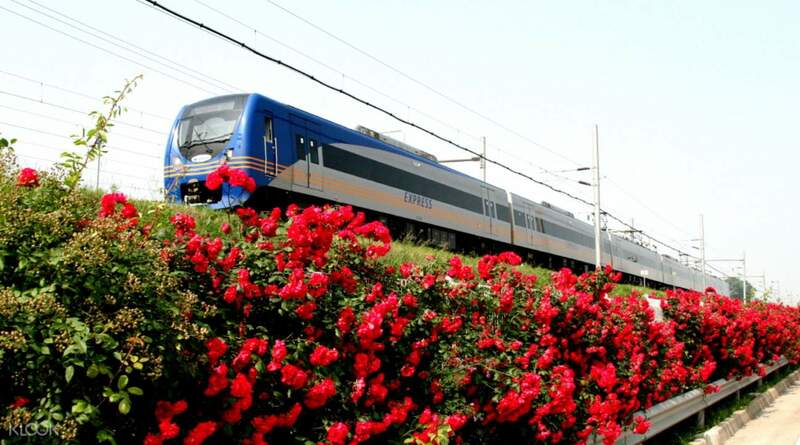 AREX very exciting and good activity. I highly recommend this activity because it has a fast arrival time in seoul station. Thank you klook for an easy ticket exchange and it is very cheap compare to other agencies!!! Looking forward to visit Seoul again in future! 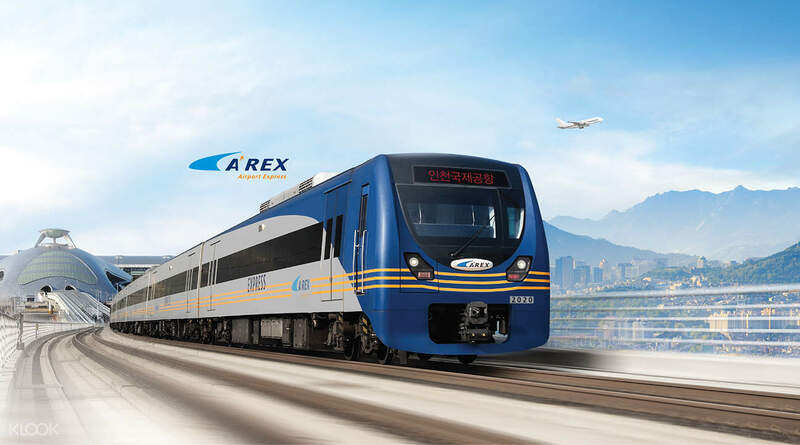 AREX very exciting and good activity. I highly recommend this activity because it has a fast arrival time in seoul station. Thank you klook for an easy ticket exchange and it is very cheap compare to other agencies!!! Looking forward to visit Seoul again in future! we are very pleased and felt comfortable using the Arex service. Faster and can save much more time . We also no need to long queue because just book in Klook. Just show the mobile voucher and you will get the ticket. we are very pleased and felt comfortable using the Arex service. Faster and can save much more time . We also no need to long queue because just book in Klook. Just show the mobile voucher and you will get the ticket. Cheaper than purchasing the ticket onsite, easy to redeem. After getting the AREX tickets, you can also check in your luggage at the check in counter if you’re taking one of Korean airlines (Korean airlines, Asiana airlines etc) which is really convenient as you’ll no need to lug that heavy luggage around or find storage lockers as it’ll likely be used already. Cheaper than purchasing the ticket onsite, easy to redeem. After getting the AREX tickets, you can also check in your luggage at the check in counter if you’re taking one of Korean airlines (Korean airlines, Asiana airlines etc) which is really convenient as you’ll no need to lug that heavy luggage around or find storage lockers as it’ll likely be used already. I booked the AREX tickets twice from the airport to seoul and from seoul to the airport. Both trips took exactly 43 minutes as mentioned. The redemption of the tickets is really easy and fast. Thank you Klook for making my journey easy. I booked the AREX tickets twice from the airport to seoul and from seoul to the airport. Both trips took exactly 43 minutes as mentioned. The redemption of the tickets is really easy and fast. Thank you Klook for making my journey easy. I arrived at ICN at 5:30am, I booked the ticket at the airport and received the code within 2 minutes. Use the code and get an official ticket at the ticket counter. This ticket allows you to take the express train to the city, fast and simple. The only thing I would like to remind everyone is Seoul metro stations has lots of stairs, be ready if you have a heavy luggage. Have fun in Seoul. I arrived at ICN at 5:30am, I booked the ticket at the airport and received the code within 2 minutes. Use the code and get an official ticket at the ticket counter. This ticket allows you to take the express train to the city, fast and simple. The only thing I would like to remind everyone is Seoul metro stations has lots of stairs, be ready if you have a heavy luggage. Have fun in Seoul.